Content - ADJ Delivers Big-Budget Vegas Lightshow for Less! Once a popular after-hours Vegas club that closed for five years back in the early-2000s, TRU was more-recently resurrected as an indie club. Positioned off the Las Vegas strip in the neighboring city of Henderson, Nevada, it offers a different clubbing experience to locals and tourists-in-the-know, with a commitment to using local DJs and maintaining a tight connection with the local creative arts community. The owners brought in an old Avalon sound system, providing a plenty big enough sound, but wanted to spend more when it came to lighting, with the intention of bringing TRU up to date as a modern club that locals want to spend their nights at. Working with a fairly small lighting budget of $16,000, the management team started to look around for lighting designers to complete the job. The first designer that sprung to mind was Neil Kull, who the Detroit-based company had worked with at the Crobar in Chicago, but upon viewing his website the owners decided he would be out of their price range. However, after coming up empty handed, displeased with the other prospective designers, the team at TRU contacted Neil anyway, explaining their limited budget. Intrigued by the project and its vision of building a club for both local customers and service providers, Neil readily accepted… and began researching how best to create something special on a tight $16,000 budget. Luckily for the owners, Neil had the experience to make this possible. While growing up in Chicago, he had helped his mother with the stage production for ballroom-dancing competitions and exhibitions, working old ballrooms with “archaic par cans and huge Frankenstein-movie rocker switches that shot out sparks.” Later, during his teens, he enjoyed a range of creative outlets; DJing in clubs as well as working on photography and video production. Neil first got involved with lighting design proper when DJing in a small club in the suburbs. But he didn’t find his first real break until 1995/96, when someone from the company behind the Chicago nightclubs Kaboom and Crobar saw his lighting design skills and was impressed enough to offer him some more work. At this new company, Neil soon started to get innovative with his lighting design, working to a small budget but still managing to revamp the lightshow in exciting new ways every year. After five years working his magic, he moved to Vegas in 2001 in search of more work, only to find there were no massive clubs, only lounges that didn’t use much lighting. Eventually, after a four-year break from lighting design, he started working at the LIGHT nightclub in Vegas, which featured a room designed by Richie Worboys [the innovative lighting designer featured in one of our recent NewsWave editions]. 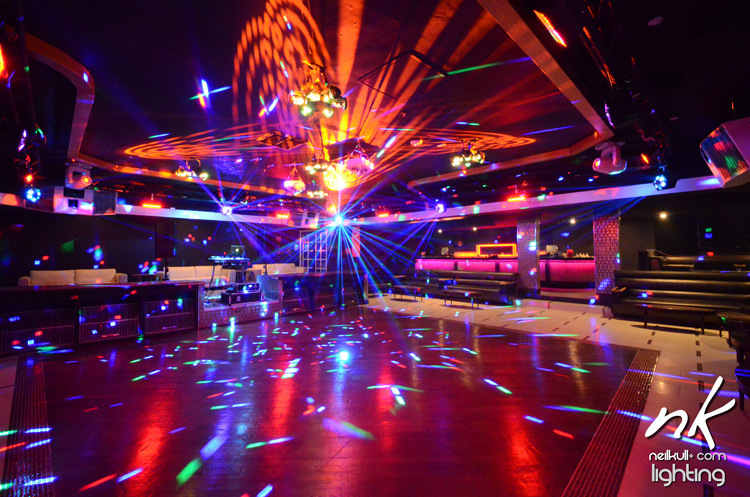 The LIGHT group – which also runs the renowned LIGHT, Haze and Bank nightclubs – called on Neil again in 2006 for the lighting design at the Jet club. All-in-all, there was no better lighting designer for the job at TRU than Neil. And he immediately set about researching how to deliver the goods on a tight $16,000 budget. After deciding that, back in the day, he would have naturally reached for ADJ, Neil started exploring the latest products. 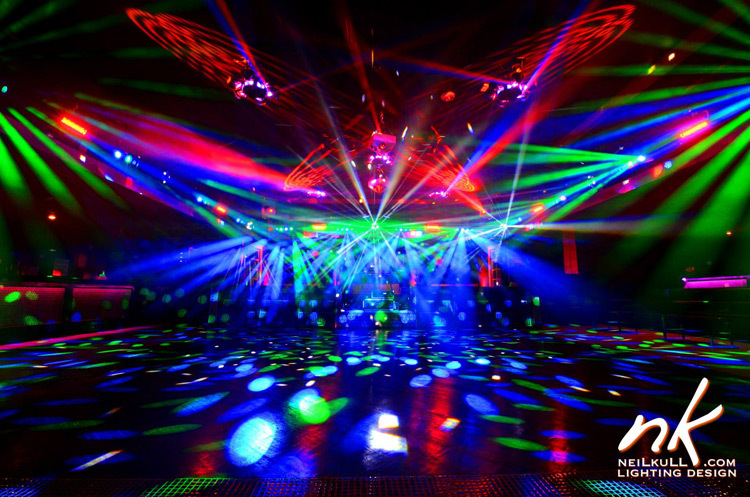 His jaw hit the floor when he realized how ADJ technology had evolved over the years, impressed by the “incredibly low-maintenance, very powerful, digital, LED products” and pleased with the potential indicated by the DMX breakdowns. Having put together a proposal, Neil walked into TRU the next day and laid it out on the table: “The operating partner looked at it and said, ‘ADJ, really?’ and I replied, ‘Trust me! This gonna look awesome…’” Neil also watched loads of YouTube videos, which helped him in his research and really showed him what the latest ADJ products were capable of – and these videos ultimately helped him sell his ideas to the club owners. And boy did it turn out good! Everyone involved was impressed by the end product, with the club receiving endless positive feedback, both from its regular customers and its newcomers, the latter of which experience a seriously big ‘wow’ factor when they walk into the venue’s main room! Once again, it’s the affordability of ADJ products – twinned with our commitment to making them more versatile, powerful and impactful with each new release – that really made the project at TRU such a success. Our low-cost but well-equipped lighting solutions enabled talented lighting designer Neil Kull to create an immersive, far-reaching display for TRU’s owners, despite the limitations imposed by a strict budget. It’s thanks to these innovative products and talented individuals that projects like this become possible – in this case, leaving the owners with a stunning lightshow that completes TRU’s evolution into a haven for local club-goers in search of something different.